Viral inbox is like having Microsoft outlook on steroids, the mailing software allows you to create a unique email for every single list that you are ever likely to sign up to. For example instead of using your personal email to subscribe to my newsletter you could sign up for it using your viral inbox address instead. the emails that I send you which means everything that you get from me will be all in one place. Who is Viral Inbox For? 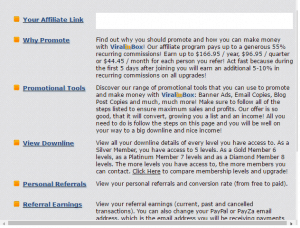 Viral inbox is for anyone who is looking to get into or is already in internet marketing. As it allows you to keep all your important correspondence in one place and one folder. If you have ever used Gmail, then you will see how useful this could be. If you are interested in referring new members, The system also allows you to build a list with a downline up to 10 levels deep. This basically means if you sign up 10 referrals and they, in turn, do the same, you are able to send your promotion or one-time offer to your entire downline email list to all 110 people 10 x 10 + 10 = 110, this is only the tip of the iceberg. How Does Viral Inbox Work? you will also see emails in the specific folders that you have set up, see example below as it sounds complicated but it really isn’t, trust me, if I can do it then it will be no issue for you guys. Imagine the email below was your viral inbox default email, I’ll call you Peter to make it easier. When you are sent an email from my autoresponder it automatically goes into a new folder in your viral inbox dashboard called list-building then if you want to read it all you need to do is approve it..siiimmmppplllleeess. You can make money by using viral inbox, well firstly the time that you will save sorting through your emails will save you time and we all know that time equals money. You can spend that time instead marketing your business and getting traffic to and improving your website or marketing strategy, it is a lifesaver for me as I do get distracted by shiny Buy Now Buttons. Secondly, you can make money by referring new users to Viral Inbox and as they join under you this means that you can send them all your offers and promotions, you are basically building a list, which is one of the most important elements in starting an online business. Thirdly, if you refer new users to Viral Inbox and they, in turn, upgrade to a gold, platinum or diamond then you get a commission based on your own level. Obviously, if you are on the free membership then you get a lot less than if you were a higher level member. Lastly, you can take advantage of the powerful mailer system which allows you to email 3000 members every 3 days, imagine what that could do if you had the right offer to put in front of them. Is viral inbox worth it? I think viral inbox is worth it, I use it myself and it allows me to keep my personal inbox just for my family and friends, it also allows me to keep all my promotional/scam emails in one place. The main reason I do this means that I can study how my internet marketing peers are trying to get their message across when they are building a list themselves. It is amazing the little tips and tricks that you can pick up by reading what others are sending you. Finally, it also keeps me up to date on what the latest product/scam is and how to avoid it. you will notice that one of the methods that I use to sniff out a scam in the above post is Tip No 3 Multiple gurus sending me the same offer. If your interested in joining viral inbox for free then check it out below or click any of the images on the page.